Read the Bible together with the concise devotional study notes of Matthew Henry. This edition has some unique features: - Complete Study Bible containing the Bible text as well as Matthew Henry's devotional study notes. - Bible text and devotional notes are fully integrated. You can read the bible text and notes without the need to jump back and forth to different locations. No need to switch between Bible and Commentary. You find Bible text and Matthew Henry notes close to each other, clearly distinguished from each other by typeface and background. - Contains Bible text, pericope titles and devotional study notes - Easy and quick navigation to every book, chapter and pericope - Optimised in design as well as readability. Clear distinction between bible text and commentary. - Available in 5 different editions: King James with footnotes, Revised King James (Webster), American Standard, Darby or Young's Literal - Published by Importantia Publishing, a specialised Bible Publisher with experience in electronic publishing since 1992. - Text of both the Bible as well as Matthew Henry devotional study notes are fully proofed. 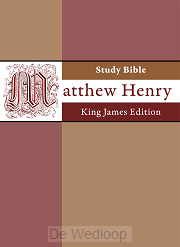 - Much time, research and experience is invested to develop this Matthew Henry Study Bible. This is not simply a text taken from an unproved source and quickly converted to an ebook. This is the fruit of a well-thought project undertaken by a Bible publisher with the mission to publish quality ebook editions of the Matthew Henry Study Bible.